Ever since we got PADI certified in Thailand, we’ve wanted to dive again. Unfortunately, work and life got in the way and it was only now, almost two years later, that we had the chance to go scuba diving. 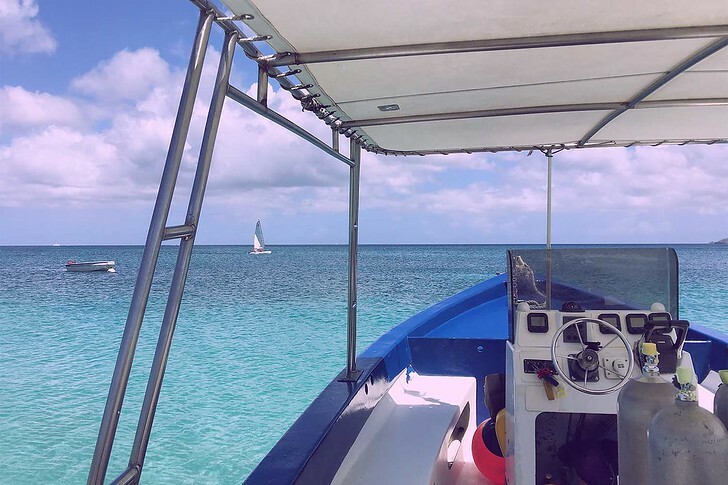 They say good things come to those who wait and luckily this time we had the opportunity to visit one of THE most stunning locations in the Caribbean for diving: Grenada! We dived the world’s first underwater sculpture park and a couple other beautiful sites with EcoDive – keep reading for what it was like and tips on visiting Grenada! 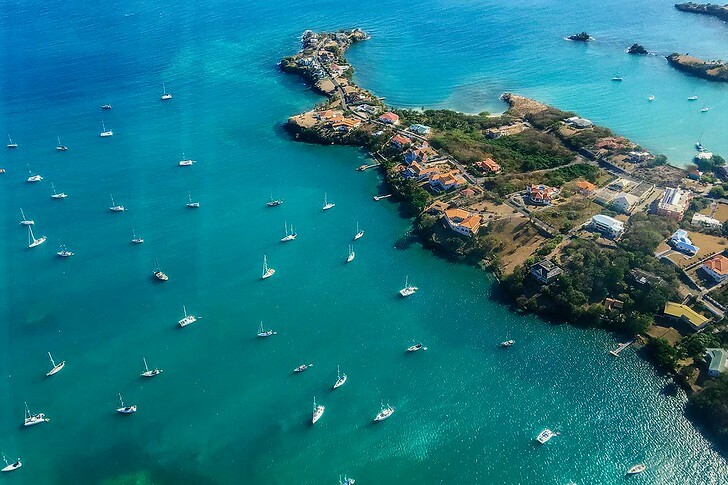 Grenada is renowned among diving circles as the Shipwreck Capital of the Caribbean, littered with numerous sunken ships, colorful marine reefs and the world’s only underwater Sculpture Park. Diving on the main island is primarily concentrated on the west and south coast, where the Caribbean Sea meets the Atlantic Ocean. 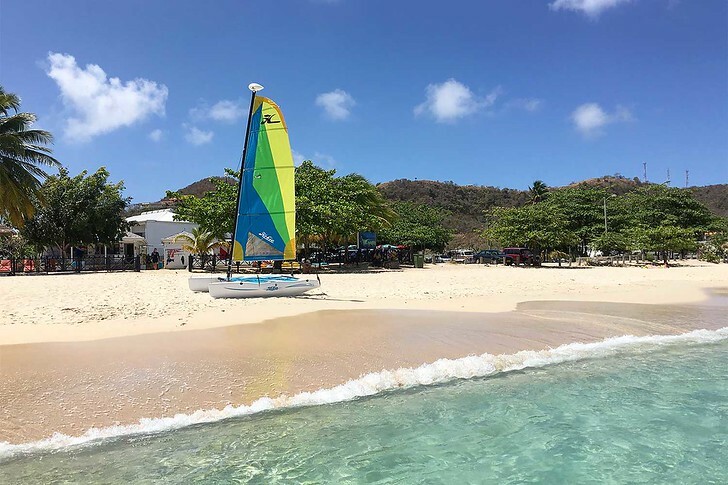 Read more: 15 Fun Things to Do in Grenada, the Spice Island! The main highlight on the island (for advanced divers) is exploring the site of the Bianca C shipwreck. The Bianca C was an enormous 600-foot passenger cruise liner that had the unfortunate luck to sink not once, but twice:. The first time it sank in France before being completed and the second time, an engine room explosion while the ship was in Grenada’s harbor destroyed it for good. Luckily most of the passengers and crew were saved by Grenadian fishermen and boat owners. This ‘Titanic of the Ocean’ currently lies about a mile from Grand Anse beach 165 feet under (50 meters) and is frequently listed as one of the top 10 wreck diving sites in the world due to its sheer size and presence. There are few other shipwrecks that compare in warm waters! The ship itself sits upright on her keel, so divers have the opportunity to dive into one of her upper deck swimming pools. Due to the depth and strong current where the shipwreck lies, only advanced PADI certified divers can visit the Bianca C dive site. Book: a Bianca C dive session here. Looking for a challenging dive? Then check out Hema! This 50 meter long freighter is one of Grenada’s most intact shipwrecks. It was built in 1963 but sank in Grenada’s harbor during a period of rough seas, when the bilge pump failed to work properly. Divers can often spot Great Barracudas, nurse sharks, reef sharks and eagle rays on a visit to this wreck site. Because of strong Atlantic currents, this is a challenging dive for advanced divers. Book: a Hema Wreck dive session here. In 2000, a commercial ship sank on its way from Grenada to Trinidad, as it carried a heavy load cargo. Divers can explore the fully upright Shakeem wreck and the brand new artificial reef, which is now teeming with marine life! Book: a Shakeem Wreck dive session here. King Mitch shipwreck lies 6 miles off Grenada’s southernmost tip. Dive 37 meters (120 feet) deep to swim with black tip reef sharks, sea turtles and large barracudas. This site is for advanced divers, due to the challenging Caribbean currents. As for the wreck, it’s mostly a skeleton of the once grand mine sweeper cargo ship. You can explore the hull, holds and bags of cargo lying 60 meters (200 feet) across the sea floor. Book: a King Mitch dive session here. Not an advanced diver or don’t want to wreck dive? Not to worry, there are more than 30 other dive sites to explore on the Spice Island! The Veronica is truly unique, as it’s a shipwreck lying in shallow waters. Just 15 meters deep,, the 40 meter long freighter is home to damselfish, sergeant majors, creole wrasse and horse eyed jacks. Barracudas, porcupine fish and french angelfish are all common too! Swim around the stern of the ship to see 2 anchor chains on top of the reef and check out the crane which was once used to shift cargo. 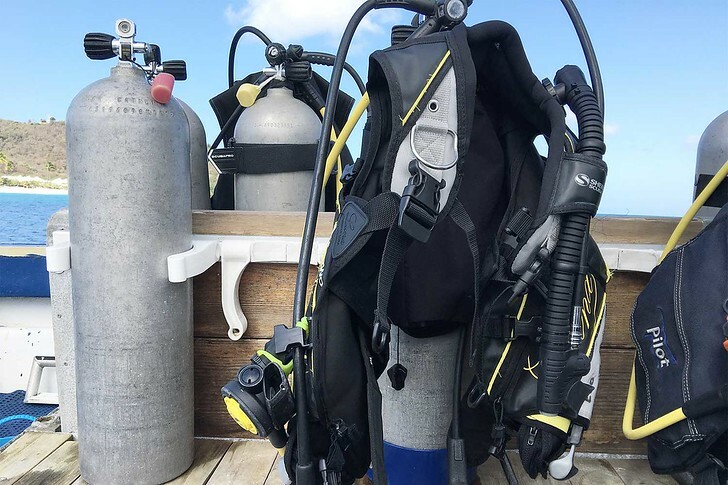 The Veronica is perfect for both beginner and advanced divers. Book: a Veronica L dive session here. Grenada’s Underwater Sculpture Park is based on the original sculptures of British sculptor Jason de Caires Taylor. Some of the statues are newer, some are older so they make for a great variety of growth and fish. Ring of Adults, a second circular ring of statues mimicking the beginning of the dive. Book: a Marine Sculpture Park dive session here. Flamingo Bay is one of the top sites of the island, about 20 – 90 feet deep or 6 – 27 meters. The reef site is home to spotted drum fish, yellow tail snappers, bar jacks and sometime seahorses and makes for a great dive for divers of all levels. This is also a popular snorkeling site so if you share a boat with a snorkel group you will likely spend the morning at both the Sculpture Park and Flamingo Bay. We saw the most beautiful angel fish and got a glimpse of the spotted drum fish on our dive here! Book: a Flamingo Bay dive session here. This pretty reef is a distinctive color thanks to the creole wrasse which inhabit it! When they swim downwards in formation, it looks like purple rain. If you’re limited on time, Purple Rain makes for a scenic dive that’s also conveniently near the Grand Anse resort strip. 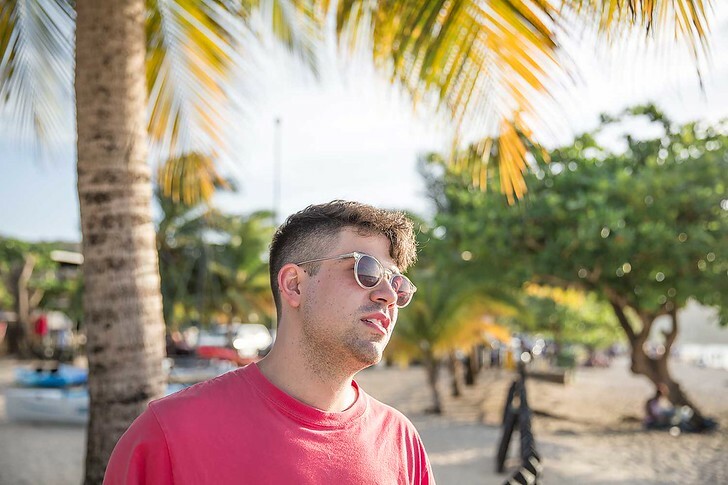 The sloping reef ranges from 15 to 27 meters in depth and is inhabited by black coral, luminescent sponges, spiny Caribbean lobsters, moray eels and of course, lots of colorful reef fish! Book: a Purple Rain dive session here. Where the Atlantic Ocean meets the Atlantic, you’ll find Fisherman’s Paradise. This small reef is one of the most exciting coral reefs in Grenada, thanks to its strong currents. With overhangs, caves and ledges, plenty of fish call this site home. Watch chub fish, eagle rays, southern stingrays and even nurse sharks… on every dive! The reef has a depth between 7 to 16 meters and offers great visibility. Book: a Fisherman’s Paradise dive session here. Near the Bianca C is Whibbles reef. This sloped site bottoms out to 50 meters, and you can find soft corals, shoals of fish, rainbow runners and horse eyed jacks. Divers like to drift between the deeper water and shallows. Book: a Whibbles Reef dive session here. Rum Runner is so-named after the shipwreck lying here about 32 meters deep, but it’s the nearby coral reef that you’ll be diving! You can often spot colorful creole wrasse, French angelfish, moray eels, lobster, trumbet fish and more. If you’re lucky, you might come into contact with nurse sharks and eagle rays! This is a gentle drifting dive perfect for all levels. Book: a Rum Runner dive session here. Kahonee is a shallow coral reef about 40 feet deep or 12 meters and perfect for underwater photographers. There’s an extensive array of marry line and divers may frequently see feeding hawksbill, barrel sponges and squirrel fish. This was our first dive where we saw a turtle just minutes into our morning! This 25 – 85 foot (8 – 24 meter) reef is just outside St. Georges harbor and is famous for its group of over 20 admiralty anchors, many of which date back to the 1800’s. The reef itself has a magnificent wall that starts about 8 meters below the surfacing all the way down to the ocean floor and entirely encrusted along the coral and sponges are the anchors! You’ll be able to spot reef dwellers, pelagic fish and barracuda if you dive here. Red Buoy isn’t frequently visited but if you’re a repeat visitor looking for something different, you can ask them to take you here. Invasive lionfish have really taken a hold here so staff are extra vigilant here! This is an extensive reef system about 20-80 feet (6 – 24 meters) extending from the harbor of St George to the southernmost tip of the island. The upper reef is home to Lobster, Spotted Moray eels and the occasional passing green or hawksbill turtle. A distinctive hole that drops down to 18 meters is a popular hangout for Barracuda! On our dive we stayed right about 13 – 18 meters deep and saw a wide variety of fish and some barracuda. Located within Grenada’s Marine Protected Area, this reef has a series of gullies and sand channels with lobster, scorpion fish and moray eels. There’s a good range of topography, with the shallow inner section of the reef being the Underwater Sculpture Park. We went to see the sculptures on one day and then on the second, a group of snorkelers came on the boat with us so we did our dive on the outer section of the reef while they snorkeled the sculptures. 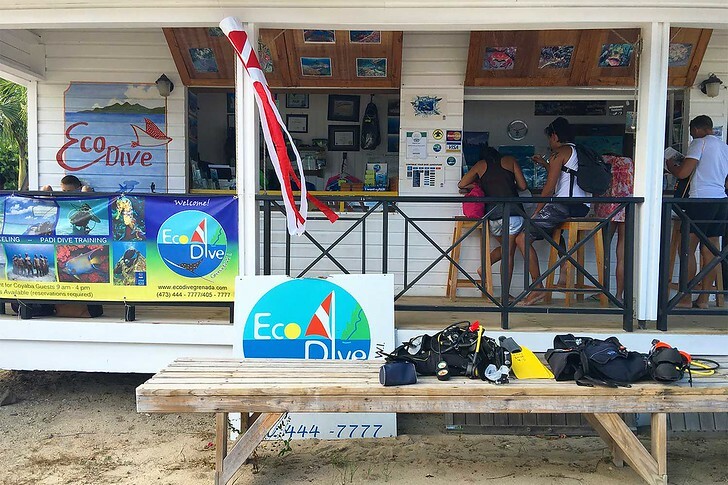 During our limited stay on Grenada, we had the opportunity to dive 6 times with EcoDive Grenada, a local dive shop located right on Grand Anse beach within Cobaya Beach Resort. 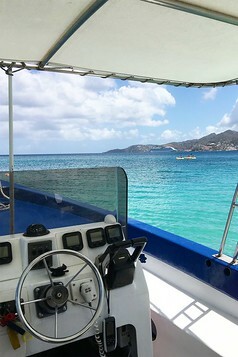 Here’s a look at our scuba diving experience in Grenada! 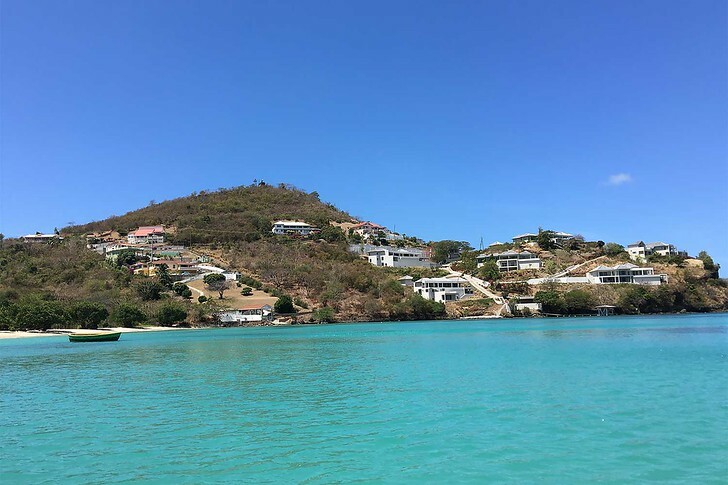 Eco Dive and Trek is led by local marine biologists Christine Finney and Andre Miller and is the only dive center on the island with on staff marine biologists. 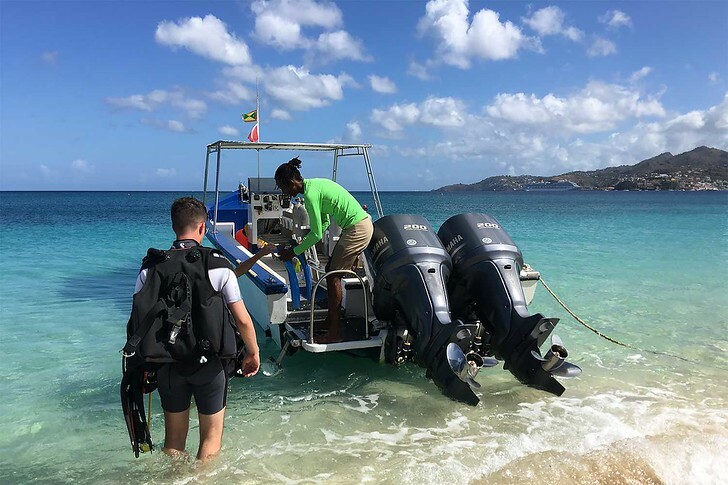 The dive shop has close ties with St George’s University and Grenada’s Marine Protected Areas and is quite involved with marine conservation efforts on the island. We liked that the dive shop was Grenadian owned and operated and had a history of commitment to protecting the local reef and coastal ecosystems. 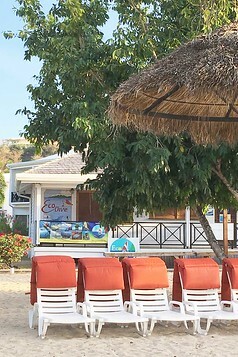 We also loved how conveniently located Eco Dive Grenada was, as it was perfectly located next door to our hotel right on Grand Anse beach. 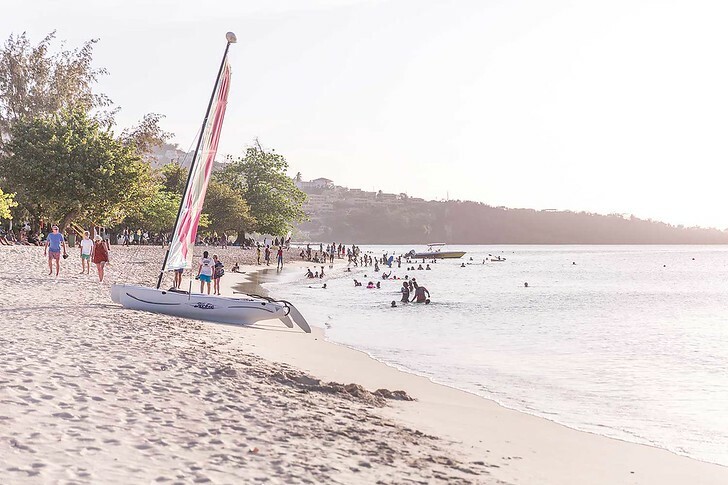 Each morning, we’d leave the Radisson Grenada, pick up bagels and coffee from New York’s finest bagels right across the street on Grenada’s “Wall Street” and then take a leisurely 5-minute stroll on the beach to get to the dive shop. EcoDive has tons of gear available for rent in case you didn’t bring your own – wetsuits, regulators, vests and flippers aplenty. We did two dives each morning, leaving Grenada around 9:30am and arriving back around approximately 1pm, depending on which dive sites we had visited that day. The staff were great about making sure our gear was set up properly. We were more than a little rusty for our first dive and it was comforting to have their experienced dive master look things over. We visited five different dive sites over the course of our stay and were very pleased that the staff made sure we saw a lot of variety and got to experience different dive sites. We saw really diverse coral reefs, the sculpture park up close and some of the absolute biggest lobster I’ve ever seen. Most of the lobsters were well hidden inside nooks and crannies in the reef, but the dive staff were great at spotting them and pointing them out to us. We also saw sea turtles (twice!) which was a real highlight. The first sighting was on our very first dive and the turtle swam with us for a little way before swimming off. The second time the turtle was beneath us, lounging calmly on the sea floor. The surreal thing about diving is that you not only look left, right and straight ahead, but up and down (which can be a bit tricky to get used to). I always feel like I’m on Mars or another planet because I can hear the giant tank of air and I’m peering out of a bubble. Maybe that’s just me… C laughed when I mentioned this to him. Each dive was approximately an hour long. If you’re more advanced, you’re relatively free to explore on your own and take photos, videos or get up close to the marine life. 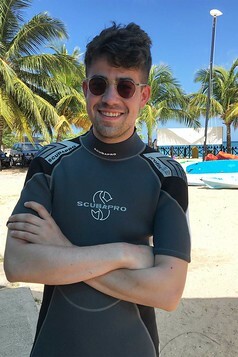 If you’re more of a beginner and want a bit more guidance, the staff are also great about leading you along throughout the dive and pointing out unique animals along the way – we saw some stunningly beautiful angelfish and even a spotted drum fish thanks to Eileen! Some invasive species of lionfish have entered into the reef and the dive staff do a great job of catching them and spearing them. The first time I saw them do this, I have to say I was a bit confused. I later learned that lionfish are not native to Grenadian waters; they’re an in Indo-Pacific fish that feed on small crustaceans and fish and can cause the extinction of native plants and animals so Eco Dive is always looking to protect the reef ecosystem by removing the lionfish. There’s plenty of water and sunscreen available on the boat, which was a nice relief in between dives. You’re welcome to bring your own snacks for a little pick me up! In some dives, the current was strong, in others we floated leisurely. In either case, the dive boat always watched for our buoy and quickly came to pick us up after we surfaced. The dive boat is smaller than the boats we were used to in Thailand but the nice thing about this is that it keeps the group size small. There were never more than 8 or 10 people on the boat each morning and in some instances only 3 or 4 people total. We found it easy to roll backwards off the boat to start the dives and also easy to climb up the ladder post dive. Most of the dive sites were only a 10-20 min zippy ride away from Grand Anse beach and if you’re a cruise ship passenger they are accommodating about dropping you off in St George. 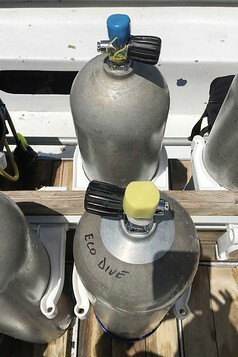 They are getting a second, new boat beginning in the spring so it’s the perfect time to do a dive with EcoDive! 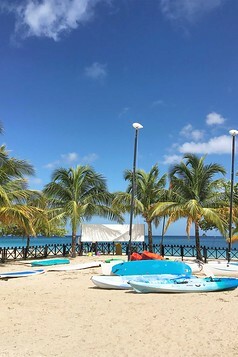 If you’re not a diver, snorkeling is a great option and fun activity to do in Grenada, as the island is home to the world’s only underwater sculpture park. The sculptures are made of concrete by various artists and sunk to create artificial reefs to enhance the local reef. If you’re interested in snorkeling to see the sculptures, it’s worth it to go with a proper dive company like EcoDive. We saw a lot of confused individuals snorkeling on their own (some sans boat, which was even more bizarre as I have no idea how they got out to the reef in the first place). More than a couple people couldn’t find the sculptures and asked us where to look. Molière reef is a relatively large site but the sculptures are concentrated in one section. Going with a dive shop provides a bit of guidance and structure so you don’t spend effort swimming without seeing anything interesting. Overall, we had a great experience with EcoDive Grenada and found them to be safe, well organized and fun! Do you like to scuba dive? Which site are you most looking forward to exploring in Grenada? Our trip to Grenada was hosted by the Grenada Tourism Board. Our decision to write this post and all opinions within are our own. Such a cool experience! These photos are beyond!! Great review! Love these photos! I wish I wee there to enjoy!! This looks and sounds amazing! I’m so jealous, such lovely photos too. I wanted to do my paddi at the Gili islands as I heard it is the cheapest place to do it. It was still 300€ though. Resourceful article, thanks for sharing! Hey Dani – you should look into doing it on Ko Tao in Thailand. It is definitely the cheapest place in the world to do and to boot, super safe with a really high quality level of instruction. The island has a lot of dive shops so high competition really keeps prices low. I recall that my open water certification cost just over $300 when I did it there and included accommodation. I love diving! I just got certified last year! Beautiful photographs and a great post on diving.Its always great adventure to explore the ship wrecks to go back to history. Wow, what an amazing experience! I have never been diving but it’s definitely on my list! Thanks Ajaya! Didn’t get to go to any wrecks on this trip but am hoping to get advanced and wreck certifications in the future. ooh shipwrecks in Cyprus! that sounds awesome – will have to add it to my dive bucket list Claire. My son was just certified a few months ago. I’m forwarding your page to him, this is great information! Such an awesome experience. I have never done any diving trips before! My husband would love to dive here! Great place! Sounds like you had an amazing experience. My husband dives and I snorkel so a trip like that would definitely work for us. 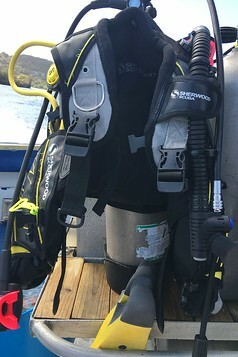 Great review and photos of your diving excursion. Since I’m not a diver, I’m glad you included the information on snorkeling in the area, as well. If I wasn’t so paranoid of sharks and other scary sea creatures, I’d love to swim in the ocean and dive. Thanks for sharing your experiences with us. How exciting! I love your photos! 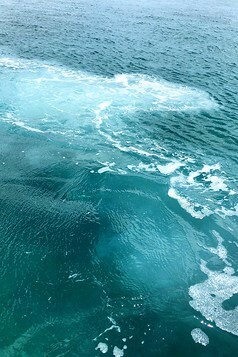 That water is so beautiful! 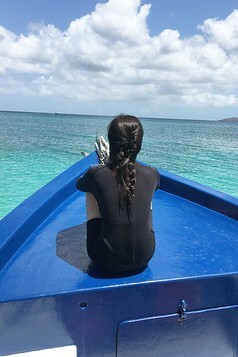 :) I’ve been snorkeling before, but I would LOVE to go diving and be able to see more!